These gentle, wonderful dogs deserve better lives than what they knew in their racing kennel days; this book will help you understand all the things that make them utterly unlike any other breed of dog. The author is recognized as THE expert on the subject and she will help you understand all that you need to know to ensure a smooth transition from the racetrack to your home. 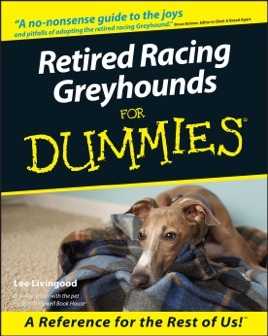 Psychological, behavioral, and medical issues specific to the retired racing greyhound are explained in easily-understood language. Most important for someone who is not familiar with these dogs is probably the explanation of the unique needs of sighthounds (why leashes are a MUST when not in a fenced yard) and why the greyhound's elegant physique and unique blood chemistry calls for both a knowledgeable owner and an informed veterinarian. These dogs are the closest thing in this world to zen; this book will help you to understand how to make one (or more!!) part of your life and how to ensure it is healthy and happy. If you follow Cynthia's advice, you will be able to be the best possible "owner" for the most loving and noble of dogs. This book was, in my opinion, well written and easy to understand. I imagine I will be referring back to it many times in the next few months. I really appreciated the helpful tips and pictures.